Do you fish for striped bass in the Hudson River? You can share your fishing trip information and help biologists understand and manage our striped bass fishery. 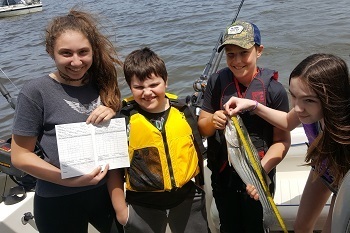 Here’s how it works: Fill out a logbook provided by us whenever you fish on the Hudson River (by boat or shore). Record general location, time, gear used, what you caught (or if you didn’t catch anything), and return the logbook when you are done fishing. You’ll receive an annual newsletter summarizing the information in addition to the latest news regarding regulations and the river. Whether you catch-and-release or take home a keeper, you can be part of the jessica.best or 845-256-3009.